Published: . Filed Under: Educating Kids, Education, Surviving Kids. Here’s a confession. Get ready for it. It’s a big one: I’m old. Like, Generation-X old. I’m closer to 40 than 30. Thus, I’m not a digital native. I was not born after the introduction of digital technology. No, I’m not a teenager or even a twentysomething. I was born far before you could upload songs to an iPod with the touch of a button. I’m a “digital immigrant,” born before the high-tech progress of laptops, cell phones, and even the internet changed our world. And here’s the worst part of my day. It happened just a few minutes ago. I sit down at my computer, and there are a million things that I could do, none of which I’m very good at. Should I read one of the hundreds of blogs that could change my thinking, touch my heart, or teach me about another world or another life? Should I connect with one of several social media programs that I’m still learning slowly? Should I write my own new content and put it out into the world? Should I make a more personal connection with e-mail or chatting? I start to get overwhelmed, anxious, frustrated, even upset. Every day I realize: I will never be able to do it all, read everything that I want, connect as much as I want, learn as much as I want. And I frequently get impatient and angry with myself. The possibilities are endless, and they’re not natural to me. For me, it’s a daily struggle to find my way in this new world. Access to information and connection is everywhere, but to me, it’s not a smooth transition. It’s like a foreign language, and I’m slowly becoming fluent. I’m a digital immigrant, slowly adapting to this new world. There are so many choices, so many ways of interacting. 1. Avoiders: People who don’t adapt to new technology at all. They might still get the newspaper delivered, refuse to text, or be unwilling to learn how to use a new smartphone. 3. Eager Adopters: They are enthusiastic to try and adopt all forms of new technology. They’re the first to try out every new tech trend and device. 1. They think of technology as an extension of themselves. They don’t view the online world as separate from the “real” world. Because it’s really not. 2. Learning has changed forever, and that’s good for our kids. Really. Rote memorization, constant lectures, and even the traditional classroom environment more generally are not the best way to learn. And we should embrace that in our lives. There are endless possibilities to learn skills and make new connections. 3. Stop worrying about it, and just do it. That’s what digital natives do. Have you ever seen a kid use an iPad? They’re not worried about using the software correctly or being able to repeat what they just did the next time. They just go. I will never be a digital native, but my son will be and I never want to be an alien in his technological world. And I’m trying to let go of my anxieties and fear of failure and just embrace technology. It’s more than a tool; it’s a changing world. That’s scary but also kind of fun. So that worst part of my day, when I sit down at the computer and get overwhelmed and want to open the nearest novel (not on my Kindle) or just turn on the easy television? I’m slowly getting over it. Just don’t ask me to like it all the time. What kind of digital immigrant are you? How did you learn to embrace technology? Thanks to my FTSF hosts: Stephanie, Janine, Kate, and Dawn! 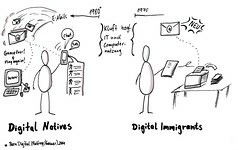 Digital Natives/Digital Immigrants – what to do? OK, so we r closer in age than I suspected. Not that I really thought much about it. Age is really pretty irrelevant. My blog has helped me to embrace technology so much more. I want to succeed at it so I must try, learn, fail & try again. When I write “code” to add links to my blog & they work I almost jump up & down. My daughter just taught me how to “screen shot”. I am loving it all even when I have to try try again. I am not going back…like u trying to keep up….and age or not I think we all feel overwhelmed with ALL the possibilities. That worries me more about kids & technology…the under current of obligation, responsibility to it..read that, respond there, post that…they do need to just put it down sometimes. Excellent point that they view it as part of themselves, their world, not an escape from it. That stuck with me. Well said & true. Again another thought provoking post ~ Thank you! I know. That is the thing: once you get into it, it’s so hard to find balance. You also have to learn to live a bit in the world without social media. I’m impressed that you’re doing coding! Good for you! I have crashed my blog a couple times trying to go into the coding. That’s me too! I can’t tell you how many times I read articles about pinterest or G+, and then closed my computer in frustration or in a state of overwhelmed bafflement. I am definitely a reluctant adopter ~ I sent my first text just about 2 years ago! But you’re right, this is where it is going. My district is rolling out iPads for students, and in one more year, every single one of my students will have an iPad issued by the district. I’m still figuring out how to use apps like Notability and how using the iPad will change (or maybe not change) my teaching. I am 38 and it is challenging for me…. and for some of my older colleagues (for whom switching to taking attendance and submitting grades online was a major challenge) this will be difficult. Interesting ideas to ponder – thanks!!! OK, now you made me feel old. I’m also closer to 40 than 30. Yikes! I think I fall between reluctant and eager. I’m using the social media that is pretty mass now, but I’m slow to adopt some of the stuff that is just emerging. I do feel a slight pressure to stay on top of things given I work in Marketing, and as my kids get older, I want to make sure I try to stay one step ahead of them. That will likely be an impossible task, but so far, so good. Plus, I don’t want tech to take over my life. I want to have real connections too! So do I, honestly! Thirtysomethings — in some ways — have the best of both worlds, I think, particularly if they work in tech-driven fields. They can “unplug” and understand how to live a non-digital life, but they also don’t have too hard of a time adapting to new media, compared to baby boomers and previous generations. YES! This! This is so fantastic, Jessica! I am an overwhelmed Gen X blogger (love the term “digital immigrant!”) and I related to this post SO much. Those tips are actually quite helpful- I wish I could think of the technology as an extension of myself. I still feel like I am living a “double life” sometimes, as I find the integration of the virtual world and my “real life” to be very polarizing and disorienting. Wow- loved this! Thanks, Steph! There’s some fantastic research on “digital natives” and “digital immigrants.” But I think the lines are blurring every day. Yet I’m still always going to be an immigrant… That’s a great way of putting it: “a double life.” And the lines between my “lives” don’t often blur. That’s definitely a characteristic of a digital immigrant! Ok I’m an early adopter but if you’re old, I’m ancient! I’m 44 and have an almost four year old. Kristi Campbell recently posted…Ghetto DIY. A homemade carwash. If we have a second kid — which is a BIG “if” at this point — I’ll be right there with you! This is great!! I recently crossed the line of being closer to 40 and have been a reluctant adopter. I doing better, but it is overwhelming. I just joined Twitter a couple months ago. I still don’t really get it and it goes so fast I just can’t keep up! Lisa @ The Golden Spoons recently posted…Mornings – Bah Humbug! I’m between reluctant and eager. I’m super frugal, so that was my reasoning for not getting a cell phone for so long and then I just got my smart phone seven months ago. Whoa, has it changed my life. In good ways and bad. I have to purposely leave my phone at home or put it face down when I go out or do things around the house, so I don’t get distracted. I’m old too. I didn’t know how to even turn a computer on until I was in my junior year of college. My first college research papers and essays were typed on a typewriter. Yuck! That point you made about technology being “an extension of themselves” is really interesting. One of my good friends that is very social and never shy said to me (the shyer, introverted one) in regards to social media, “you know it’s not real, right?” I immediately, said, “yes, I know it’s not real, I can walk away anytime.” But can’t I do that anywhere with anyone? It’s all real life, just different. Stephanie, whom I met through blogging is coming to stay at my house in July. If she isn’t real now, she will be then. A lot of my connections on-line are with family – they’re real. Many people these days have met their spouses through the internet – very real. Such interesting things to ponder. Great post! Yup, I’m closer to 40 too, and I first used a computer with Internet when I was doing my PhD! But, I am an eager adopter and I totally agree with you that this is a much, much better way for our kids to learn! Roshni recently posted…Lose weight or be healthy? I liked your take on this one Jessica! I am not sure where I fit in. I clearly remember getting a computer with the internet somewhere in elementary school so I wasn’t born with it but I’m also pretty fearless about it. Unless it’s social media and then I’m terrified I’ll make a misstep. I am the one in the middle, the reluctant adopter. I don’t want to spend my life online and on social media, but I must do some of it. So I try to figure it out for the sake of my writing! We go waaaay back, back to the age of princess phones so no way will anyone ever wonder if we are natives. One motivation for us is that we want to be able to communicate with our kids in whatever manner they choose so if texting is preferred, we text. Very important once they are grown and flown. Oh, I wanted a princess phone so badly as a kid! It was one of my adolescent dreams to have a phone in my room. Never happened, but I wanted it! Do you remember how public your conversations often were on the telephone, even as a teenager? We didn’t even have a cordless phone for quite a while. As always you’ve opened my eyes, this time to a new term that I can completely identify with. Much like yourself I’m a digital immigrant of the same generation. I absolutely love the very wise observations you make regarding the differences in how we perceive technology as opposed to digital natives. I loved the idea that they view it as an extension of themselves. So true. I was initially going to write about dreading the choices I have to make every day and I would have probably focused on the same. So glad I didn’t, because this is SO much better than what I would have come up with. Jessica-I relate to this 10000%! That feeling when I open the computer . . . you described it so well. Read, write, connect, etc. So many options and not enough time. I’m especially bad at the graphic part of it all–taking, editing, and posting pictures. It’s really not my thing, but it IS an important part of blogging! I feel like the third category has a wide range. I’d put myself there, but my husband (who is actually closer to 30 than 40, unlike me) is way, way, way on one end of the spectrum. Being with him helps me adopt more quickly, but I’ll never be as voracious a consumer as he is. I think I’d be more eager if the new technology wasn’t sometimes so expensive! That is true! So true! I finally broke down this month and got a Mac, and its price was a tough pill to swallow! make sure that they have uploaded on their portal. Angeles area and what they each have to offer. I was jumping around all over your blog, reading here and there, and had to stop at this one. I am sooooo a reluctant adopter…REALLY reluctant. It not only overwhelms me, it pisses me off. In fact, one of my first posts on my blog over 3 years ago was how I was absolutely not going to facebook, no matter what anyone told me. When I started my blog, my biggest challenge was just that: how the hell do I start a blog? The technology aspect terrified me. And now, years later, I feel like I’m never going to be able to keep up, because even in these few short years, my little blog can’t seem to keep up…I am drowning in hashtags, tweets, pinning, liking, linking….WTF? But yes, adopting I am….